American metal band Avian, with roots in European classic and power metal with a stateside flair, return with their second release, 'Ashes And Madness.' The core of Avian is, of course, founding member and guitarist Yan Leviathan and, vocalist and Nightmare Records chief, Lance King. For this enterprise they bring on Bill Hudson of Cellador to handle lead guitar duties. The musical focus has not changed from 2005's 'From the Depths of Time;' Avian is still blending the best of European power metal with classic heavy metal and a small dash of progressive metal. If anything, Avian has become more precise in their musical pursuit maturing into a band more distinctive and secure in their own style of heavy metal. 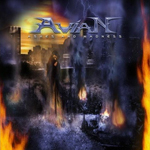 As a band, Avian is most brilliant when the classic metal trumps the traditional power metal, which is often on this album. The best examples are 'Esoteric Lies' and 'Beyond The Hallowed Gates.' The best and most ambitious song, and the one that turned the tables on my original ambivalence, is the epic and profound 'Time And Space Part II' which delivers an arrangement thick with all the best of melodic heavy and power metal. Needless to say, first impressions can be deceiving. 'Ashes And Madness' is a fine work of melodic and heavy power metal guaranteed to please any fan. Very recommended! Avian has become more precise in their musical pursuit maturing into a band more distinctive and secure in their own style of heavy metal. 'Ashes And Madness' is a fine work of melodic and heavy power metal guaranteed to please any fan.